At Hike One, we love helping clients. Corporate, start-up, or pretty much anyone with an idea who is looking to launch a new product or service. We understand as well, that every innovation project has a budget, and all too often, a lot needs to get done with very little. That is why we love working lean, based on the Lean Startup by Eric Ries, and Running Lean, by Ash Maurya. We see this as an engaging challenge. We support our clients in validating their ideas as efficiently as possible by way of lean experiments and design sprints. This helps our clients get their idea up and running, with minimal resources. Different clients have different approaches to funding innovation. But they all have a runway; the time it takes until the money runs out. Corporates, while often adopting startup methods for their own innovation project, create an artificial runway. Meaning, it’s possibly flexible. There’s budget allocated, and deadlines assigned, yes. But it’s our experience that, within corporates, the innovation budget can sometimes be expanded, if results are yet unclear or inconclusive, or if a project simply takes longer than expected to bring to market. Startups need to validate their ideas quickly because their runway is typically limited. Entrepreneurs don’t have the luxury of a corporate arm backing them. When the end of the runway is upon them, entrepreneurs have to stop or talk to investors. Before the runway hits dirt, things need to take off, and fast. It’s important to use the runway to make money quickly and pave the runway some more, or gather lots of data to convince investors that the business idea is viable, desirable and feasible. This summer, we had the pleasure of working with an entrepreneur who had a great idea and a limited – his own savings! – budget. In other words, a perfect challenge. 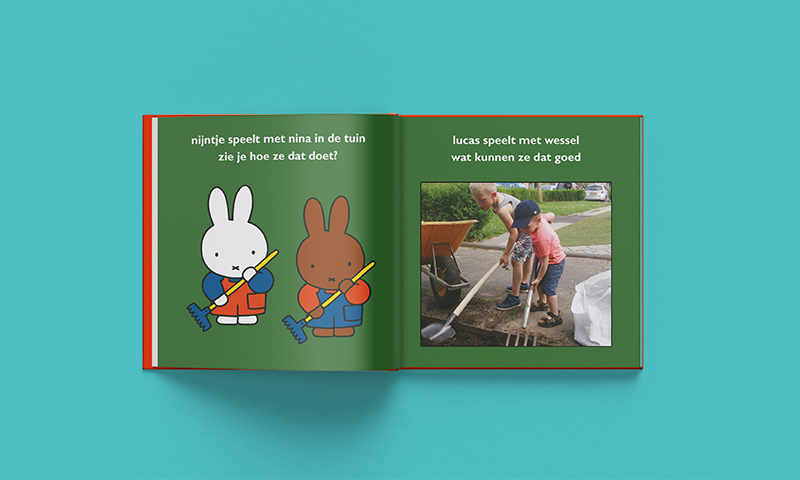 When we met Dirk, he told us about his amazing idea: personalised Miffy photo booklets for children. Each booklet would be customisable, such that a person would upload their own pictures and text on the right-hand pages. The Miffy-themed booklet would be a way for parents to teach their children about distant family members. A warming thought that also inspired Dirk to name his business FamilyBook. The first time Dirk came to our office, he brought the first and only booklet he had made. We all fell in love with the book. We saw a very creative, approachable and adorable way to teach kids about family. It was now time to talk business. What was the proposition, more precisely? Would customers want to select different Miffy page layouts, or would the pages be automatically selected from a database? Was the family theme the right one to launch the product, or was a holiday theme more appealing? What age group would this type of book attract? We all had our assumptions, but that’s all they were: assumptions extracted from Dirk’s experience and our team’s. Of course there is the traditional approach: Building a good-looking website with a fancy editor allowing users to create and edit their booklets. However, this meant a 6-month minimum development time; not something Dirk’s runway was long enough for. The website itself would be a risk. Would customers even like it? Conclusion, this option was entirely based on unvalidated assumptions. That was a no. So we applied a lean working technique and asked ourselves: what’s the smallest feasible tool we can build to validate our assumptions? The answer was simple: creating the process of creating the booklets. We came up with an InDesign data merge file and an API (application programming Interface) that communicated with a print centre. The API part was necessary since files could not be sent by email. After the two days it took us to finish the tool, Dirk could start creating the booklets on his own. Finally, Dirk created and sold his first booklets. Since he didn’t yet have a website, or any online presence, Dirk attracted his first customers from within his network. There was a lot of emailing back and forth, sending pictures, text, previews, and repeat. Once the preview would be approved, Dirk would send the files to the printer. It was a tedious process, but it provided extremely valuable insight on the workflow. Dirk then conducted interviews with the first customers to get feedback on the process and the final product. Talking to customers is extremely important for testing your assumptions. Customers’ enthusiasm for the first printed booklets is what gave Dirk the confidence to pursue his business. It was time to talk to prospects to see if the concept was appealing, and to test the price point. Hike One supported Dirk further by creating a leaflet and a simple webpage. After conducting a smoke test to determine which functionality could be most effective to test if the webpage worked, we opted to put in a field for interested parties to leave their email address for Dirk to contact them. In the meantime, Dirk was continuously talking to potential customers, at different locations: indoor playgrounds, schoolyards, coffee shops, on the streets. He pitched FamilyBook at least 100 times, all the while gathering data: how did people respond to the idea, which USPs stuck, what was the best target market. More orders came in and Dirk could test his product further. After a period, Dirk had his hands a little too full of all the emailing and adjusting. Which was a good sign: there was lots of business. Hike One went for a third round of building and integrated a simple order flow linked to the webpage. Customers are now able to select pages, upload pictures and adjust their own text via an online form. When the data is submitted, Dirk creates a PDF of the booklet and sends it, along with the invoice, to the customer. Once the customer has approved the final design and paid the invoice, the booklet is printed and sent. This is a classic Concierge prototype: instead of automating everything, there’s still part of the process done manually. The benefits are that it’s inexpensive and you can learn a lot. If the lack of scalability becomes a problem, then it’s a good thing. You most likely have enough budget to continue building your business. Nowadays, Dirk spends his days creating booklets and already, it’s getting too much. Another good sign. He’s been able to gather a lot of data through feedback, thus has learned which improvements should first be implemented to further increase sales. Have you ordered your Miffy booklet yet? Check it out at familybook.nl! Hike One is a digital product design agency. We support you in developing and validating new and better digital products, while making sure the innovation process itself is as smart as possible, and as great as your idea.